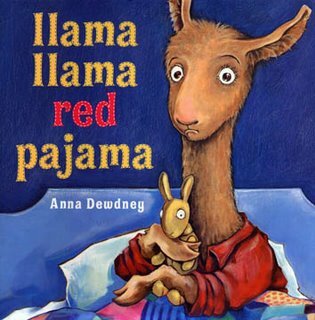 Llama Llama Red Pajama by Anna Dewdney is an adorable book... especially if you have a little one that loves to yell for mama from his/her bed at night! I love this book's message and it has been perfect to read with my little guy who is sometimes a little impatient when mama doesn't come to his room right away! I loved these suggestions of pre-reading, during reading, and post-reading questions to ask your child. It is amazing to me sometimes to watch people shush a child while they are reading to them... just so that they can finish a story. Talking while reading and listening to observations and connections made by a child is just as important as the book itself... if not more important! There comes a point when you're reading to an entire class of kids when you can't field every question, but if you're reading 1:1 at home with a child, I think conversations about books can be such great ways to build your relationship with your child and make reading so much fun. Anyways, after we read this book and talked about it, we did a little llama llama red pajama matching activity. 4. Using stickers, make each pair match. This was a project that required a lot of concentration. But I was pretty impressed that each pair of pajamas actually looked pretty similar. 5. Cut out each pair of pajamas. 6. Spread them out on a table and mix them up. Talk about the similarities and differences in each pair. 7. Find each matching pair and put the pajamas on the llamas. Point out their similarities and specific details that you see on each pair of pajamas. We specifically focused on the terms: over, under, top, middle, center, back, and bottom. The process of creating the matching llamas was actually more fun than doing the matching at the end. Love this book! Anna Dewdney has some cute activities, printables, and other resources for this book on her website.